The bare-bones gang strikes again! | ENTOURAGE BASKETBALL INC. The bare-bones gang strikes again! With only seven players available, the champs best second-place JustCo in a determined, uplifting win. Newest team member, Josh, dominated in the paint, posting a 25-point, 12 rebound double-double. 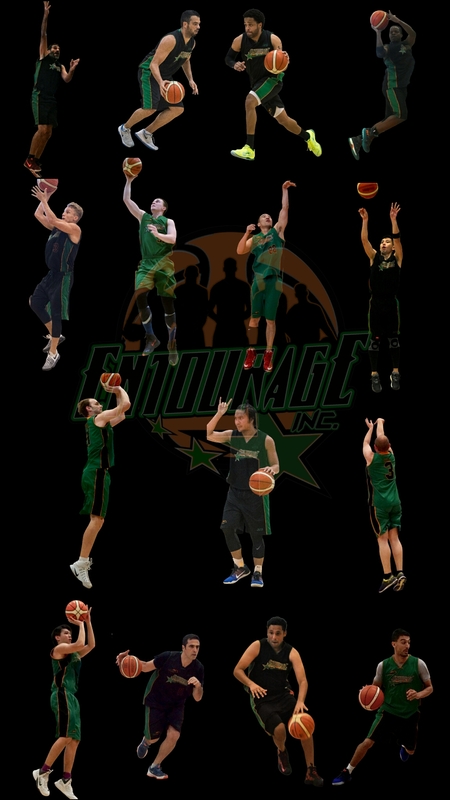 Coming off their fourth straight win against a feisty Monstars team, EntourageBBall Inc’s weekend squad had to face the resurgent JustCo team with only seven available players. Fortunately this was a rare occurrence in recent E.B.I history, the last time the team had a significant player shortage was August 2016, a game which the team handily won against eventual SE2 finalists, Hougang. JustCo, one of the legacy teams in Crossover League, was off to a great start this season, boasting the same 5-1 record as E.B.I, good for second place in the standings. They had the league’s topscorer in their ranks, Goh Tai averaging 21 points per game, and seemed poised for a statement win against the defending champions. That is until they were summarily dismissed during the 21-8 opening quarter that EntourageBBall unleashed to put the game away early. With no classic center available, coach Dave elected to place a highly adaptable starting unit on the court and that move paid dividends. Anchored by hyperactive combo-forward Josh, smooth ballhandler Lester and tenacious rebounder Mike, the starters played inspired defense to grab the lead early. The E.B.I. player-coach took it upon himself to limit the opposing team’s main man, successfully forcing him into bad shots and passing decisions. Whenever Goh Tai did break free however, the help defense by Alex, Josh and Lester kept the pressure on, forcing him into an 8-24 shooting performance (1 – 7 on threes). None of the other JustCo players could find a rhythm either, not for lack of trying. The team’s achilles heel lies within the over-reliance on their main scorer. The arrival of veteran shooting guard Jerel late in the first quarter gave the squad more firepower and he gamely took on the challenge of stopping JustCo’s topscorer upon entering the game. A task he was very successful at, all while sinking his first three long-range shots in the first half. Easy as it is to single out Josh’s performance (25 points, 12 rebounds and 3 steals) as the highlight of the match, this win was full of special performances. Sinan, normally utilised in limited minutes, was able to shine on both ends of the court, contributing 5 points to the team’s tally. The usual high-level contributors Lester (11 points) and Mike (10 pts, 7 rebounds) did a great job of balancing out the cold shooting of Dave (2-8 FG%) and later in the game, Jerel (3-10 from downtown). It was a statement win, a contest full of proud moments for the “skeleton crew,” perhaps none louder than this 2nd quarter sequence when a 28- year basketball veteran took it upon himself to emphatically lead his short-handed team’s efforts on the defensive end; no easy shots today. And just like that, the streak continues.